In September, I had the privilege of attending the Stanford Social Innovation Review’s Nonprofit Management Institute on Network Leadership. 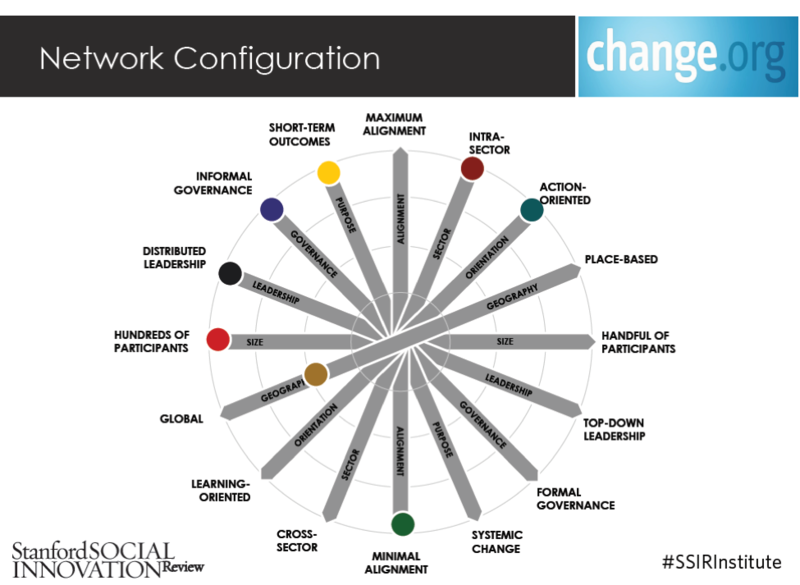 I have been interested in the topic of network leadership because every nonprofit center that we know of is or has the potential to be a network for catalyzing social good. For many years, the idea was that to increase your social impact, you had to bring your model to scale. However, researchers like Jane Wei-Skillern have found that there have been many organizations who have multiplied their ability to achieve impact by taking the opposition – slimming down their operations, specializing, and working in concert with partners. We heard many interesting examples of groups that have worked in networks to accomplish their goals – The Nature Conservancy, Habitat for Human Egypt, The Sirolli Institute’s network entrepreneurs, MORTAR, the 92nd St. Y, and more. The network approach should not be confused solely with the work of Collective Impact – that is just one way to work in a networked manner. The two-day institute was packed with case studies, theories, and practical tools for people working in networks. One of the most valuable sets of tools came from Anna Munoio and Jess Ausinheilder, of the Monitor Institute, now part of Deloitte Consulting. Working in partnership with the Rockefeller Foundation, the Monitor Institute developed Engage, a toolkit for funders interested in supporting and leveraging networks for social impact. Practitioners can adapt these tools to better understand the structure your network has taken, where you are in the network lifecycle, and what supports you need to take it to the next level. My favorite tool is the Axes of Collaboration diagram for mapping the configuration of your network. The Monitor Institute argues that every network has eight factors that influence its structure: geography, size, leadership, governance, purpose, alignment, sector, and orientation. Each of these factors represents a continuum of options. This model explains the diversity among networks, and quickly illustrates why tools from one group may not be readily adapted in another. You can map the structure of your network by drawing dots for where your collaboration lands on each continuum on this blank Axes of Collaboration template.